The Durango teleférico, inaugurated in 2010, is 750 meters long. It links Cerro del Calvario in the historic center of the city with the viewpoint of Cerro de Los Remedios. It cost about $70 million to build and its two gondola cars can carry up to 5000 people a day. Parts of the ride are some 80 meters above the city. The system was built by a Swiss firm and is one of only a handful of cable cars that start from a historic city center anywhere in the world. 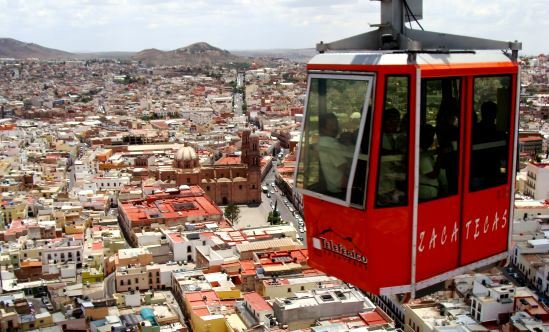 (The Zacatecas City cable car is another). The Copper Canyon teleférico starts alongside Divisadero railway station in Mexico’s famous Copper Canyon region, and runs 2.8 km across a section of canyon, up to 400 meters above the ground level. Inaugurated in 2010, it is the longest cable car in Mexico, cost $25 million and can carry 500 passengers an hour, using two cabins (one traveling in each direction), each able to hold 60 people. It is a 10-minute ride each way to the Mesa de Bacajipare, a viewpoint which offers a magnificent view of several canyons. The Garcia Caves are located in the Cumbres de Monterrey National Park, 9 km from the small town of García, and about 30 km from the city of Monterrey. The caves are deep inside the imposing Cerro del Fraile, a mountain whose summit rises to an elevation of 1080 meters above sea level, more than 700 meters above the main access road. The entrance to the caves is usually accessed via a short ride on the 625-meter teleférico, which was built to replace a funicular railway. 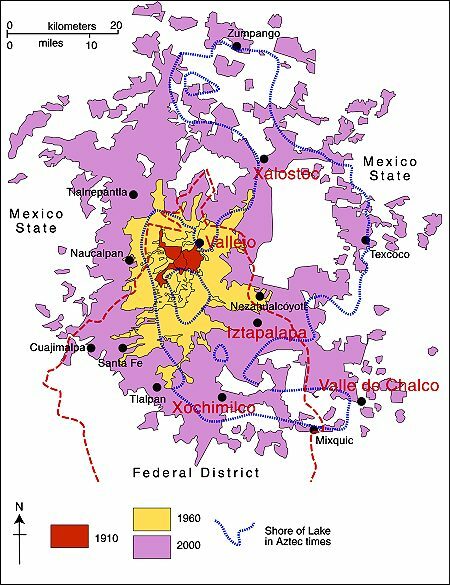 The Zacatecas teleférico, opened in 1979, is 650 meters long and links the Cerro del Grillo, near the entrance to the El Eden mine on the edge of the city’s historic center, with the Cerro de la Bufa. It carries 300,000 people a year high over the city, affording splendid views of church domes, homes, narrow streets and plazas during a trip that lasts about ten minutes. On top of Cerro de la Bufa is an equestrian statue of General Doroteo Arango (aka “Pancho” Villa), commemorating 23 June 1914, when he and his troops successfully captured the city after a nine-hour battle. This hotel teleférico is a convenient link between the hotel, set high above the city, and the downtown area of this important tourist destination, best known for its silver workshops. A second hotel in Guerrero also has its own teleférico, running from the hotel to a viewpoint atop the Cerro del Titicuilchi. 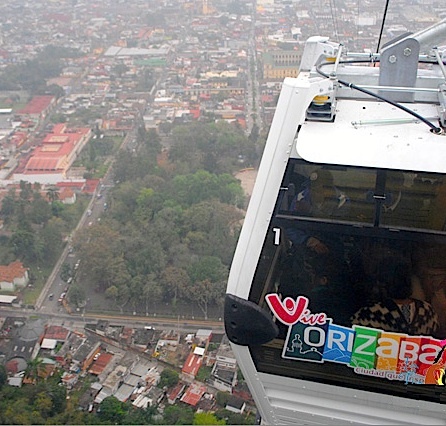 A 950-meter-long cable car, using 6-person cabins (see image), began operations in the city of Orizaba in Veracruz in December 2013. The cable car goes from Pichucalco Park, next to the City Hall in downtown Orizaba, to the summit of Cerro del Borrego. which overlooks the city. The 8-minute ride affords outstanding views over the city center. Initial construction of the teleférico in the city of Puebla, in central Mexico, was halted in 2013, amidst considerable controversy about its route and the demolition of a protected, historic building (the Casona de Torno) in this UNESCO World Heritage city. The original route was 2 kilometers long and linked the historic center of Puebla with a nearby hill, home to the forts of Loreto and Guadalupe. In 1862, these forts were the site of the famous Battle of Puebla, at which Mexican forces proved victorious over the French, a victory celebrated each year on 5 May (Cinco de Mayo). When it proved impossible to inaugurate this cable car in time for Mexico’s 2013 Tourist Tianguis (the largest tourism trade fair in Latin America), authorities boarded up the partially-completed structures (3 metal towers and 2 concrete bases) to completely hide them from public view. Construction resumed in 2014, but only of a 688-meter-long stretch which cost $11 million to build. This section, which includes a tower in Centro Expositor, the city’s main exhibition center, was officially opened in January 2016. The 5-minute ride costs about $30 pesos ($1.60) each way. Italian firm Leitner Ropeways constructedTorreón’s cable car. (Leitner built Mexico’s first cable car for regular urban transit in Ecatepec in the State of Mexico). The Torreón cable car runs 1400 meters between Paseo Morelos in the downtown area and the Cerro de las Noas, site of the large sculpture El Cristo de las Noas, reputedly the largest statue of Christ in North America. The system will initially have nine 8-pasenger cabins giving a capacity of about 380 passengers an hour each way. The cable car cost between $9 million and $10 million. It was originally due to enter service in December 2016 but finally opened in December 2017. Users pay about 3 dollars for a round trip (about 5 minutes each way). City officials hope its completion will provide a welcome boost to Torreón’s fledgling tourism sector. In 2009 Feike de Jong walked the entire perimeter of Mexico City to capture the strange scenery of its fringes. The 800-km trek took him 51 days. The author’s ebook Limits: On Foot Along the Edge of the Megalopolis of the Valley of Mexico, with the full story and more images, is due to be released later this year. Want to learn more about Mexico City? There are almost fifty places where people can legally cross the Mexico–United States border, but only one where the cities on either side of the border have the same name: Nogales. 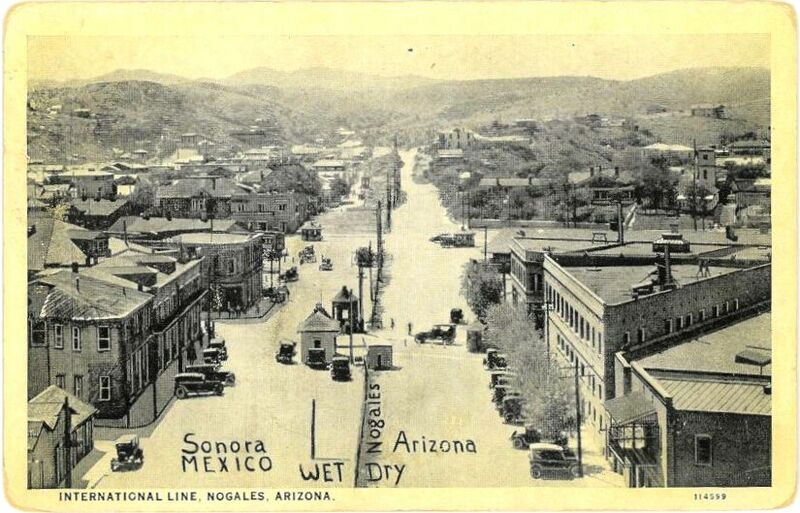 The fascinating history of the two Nogales (Ambos Nogales), twin cities on either side of the border, is related in this detailed 2010 blog post by Robert Lucas: Ambos Nogales Face Across the Border. This postcard from about one hundred years ago shows International Avenue, Nogales. The boundary line on the postcard was added by the publisher to indicate that the border ran down the middle of the street. Even in the absence of any boundary fence, residents were apparently still required to cross at one of two entry points: either the Morley Avenue crossing (shown in the postcard) or the Grand Avenue crossing further to the west. 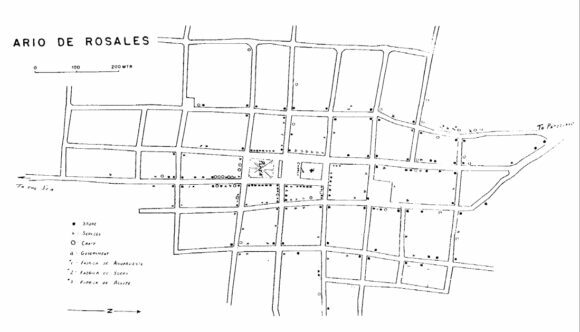 In 1897, the U.S. Congress ordered that a 60-foot strip along the border in downtown Nogales be cleared of all structures as a measure to suppress customs fraud. Mexico soon followed suit, creating the International Avenue. The International Avenue did not look like the view in the postcard for for very long. By 1916, a temporary fence had been erected down the middle. Two years later, on 27 August 1918, this area was the scene of the Battle of Ambos Nogales (La batalla del 27 de agosto), which led to a permanent fence being built, forever separating Ambos Nogales into two distinct cities. In a previous post – Mexico’s shoe (footwear) manufacturing industry: regional clustering – we looked at the concentration of the shoe-manufacturing industry in three major areas: León (Guanajuato), Guadalajara (Jalisco) and in/around Mexico City. We have also taken a look at Mexico’s international trade in shoes – Mexico’s footwear industry: imports and exports. We now turn our attention to the distribution of shoe retailers within a large Mexican city. The retailing of shoes within cities often exhibits distinctive spatial patterns. Many older and larger Mexican cities tend to have all the retailers for a particular item (furniture, electronics, autoparts, etc) concentrated in a very small area. For example, dozens of retail outlets for electronics are located within a few blocks of Mexico City’s main square or zócalo. Electronics stores are in very close proximity to one other, and occupy both sides of the street for several blocks, leaving little or no room for any other retailers. Another example of retail specialization is Corregidora street, which has several blocks dedicated to the sale of pots and pans, kitchen utensils and table settings. Returning to the subject of shoes, without which no bridal outfit is complete, shoe retailing is also often heavily concentrated in certain sections of Mexico’s larger cities. 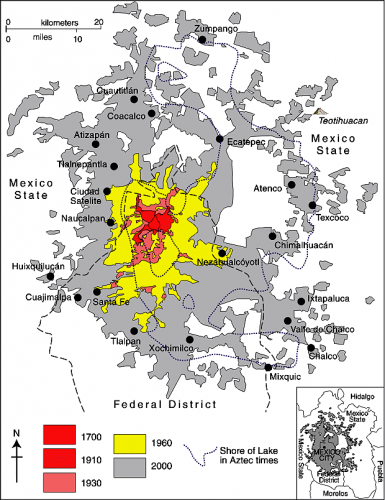 Perhaps the most extreme example is in Guadalajara, where shoe retailing is concentrated in two main zones. One of these zones is within the central business district, and is comprised of both regular storefronts and a market. The other area is several kilometers west of the center, around Galería del Calzado, a shopping plaza of more than 60 stores entirely dedicated to shoes. The Galería, located where Yaquis meets Avenida México, has a total floor space in excess of 8,600 square meters (92,500 square ft). The shops in Galería del Calzado stock every major brand and type of shoe, and eagerly compete for your pesos. From a consumer’s perspective, this is all highly convenient and allows for easy comparison shopping. However, I have never been convinced of the advantages of such concentration from the point of view of the retail store owners, unless perhaps they get their stock from a relatively limited number of (shared) shoe distributors? Despite the success of many Mexican shoe manufacturers, one of the fundamental weaknesses of the supply chain for footwear in Mexico (according to sector analysts) is the absence of any strong specialized marketer dedicated to shoes. Fancy a job marketing cowboy boots, anyone? 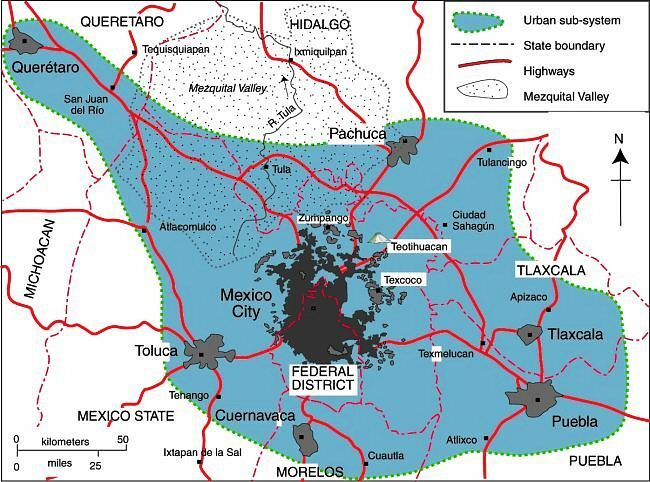 Chapters 21 and 22 of Geo-Mexico: the geography and dynamics of modern Mexico analyze Mexico’s 500-year transition to an urban society and the internal geography of Mexico’s cities. Chapter 23 looks at urban issues, problems and trends. Buy your copy of this invaluable reference guide today! The survey looked at numerous variables to quantify “quality of life”, including housing, schools, mobility, air pollution and employment. The survey also considered satisfaction with services, and satisfaction with the performance of the city’s mayor. For quality of life, the top ranking city overall, for the second year running, was Mérida (Yucatán), which scored 77.6 points out of 100, followed by Saltillo (77), Aguascalientes (71.6), Colima (70.9) and Campeche (69.8). 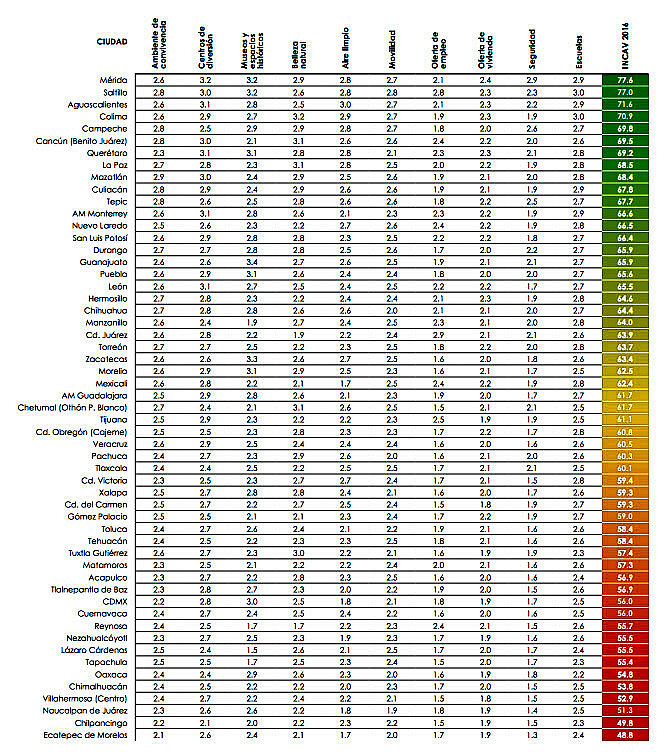 Monterrey came in 12th in the survey rankings (see table), while Guadalajara placed in the middle. The four least livable cities in the study were Villahermosa (52.9), Naucalpan (51.3), Chilpancingo (49.8) and Ecatepec (48.8). Which cities have the best and worst water systems in Mexico? This proposal sounds a lot more 21st century than Trump’s plan for a wall along the Mexico-U.S. border. Will either proposal ever actually happen? Most likely not. But that does not prevent us from considering the former project one more than worthy of mention here. Young Mexican architect Fernando Romero has long believed that “building bridges” is preferable to creating obstacles and that conventional boundaries “are just becoming symbolic limits.”Romero was named a “Global Leader of Tomorrow” at the World Economic Forum in 2002. 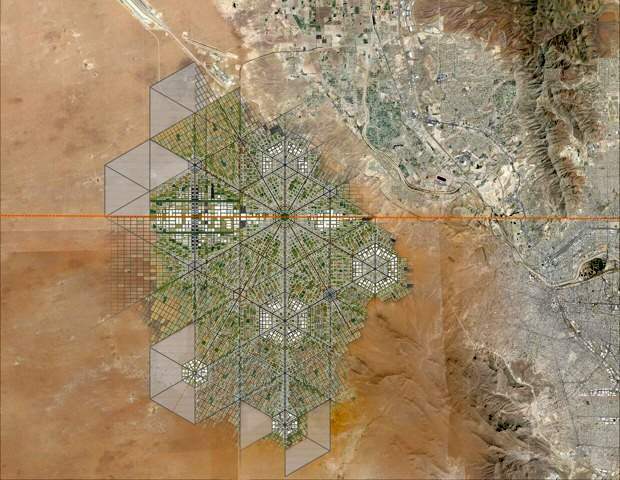 To illustrate his viewpoint, Romero recently released a master plan for a walkable, super-connected metropolis straddling the U.S.-Mexico border. More than a decade ago, Romero’s architecture firm proposed a tunnel-like “Bridging Museum” crossing the Mexico-U.S. border in the Rio Grande Valley. 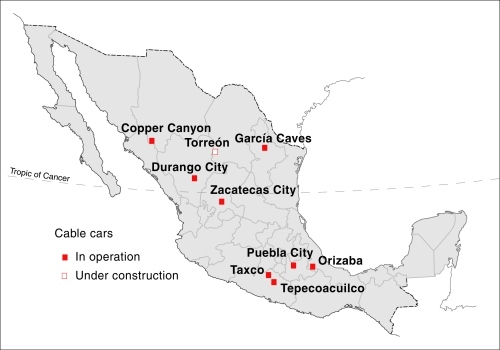 His more recent suggestion of a utopian border city, presented at the London Design Biennale, is far more ambitious and would take advantage of the concept of special economic zones (employed earlier this year by Mexico’s federal government to stimulate development in several southern states). The geography of Mexico’s drug trade (Sep 2016). 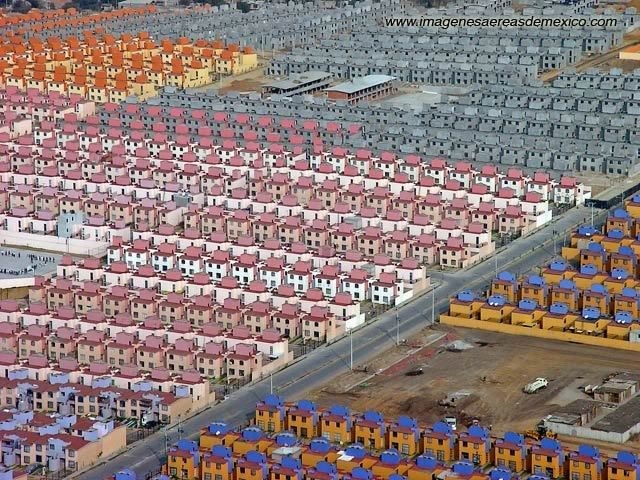 Is Mexico City sprawl a sign of a future megalopolis? Map of Mexico City urban system. Click to enlarge. 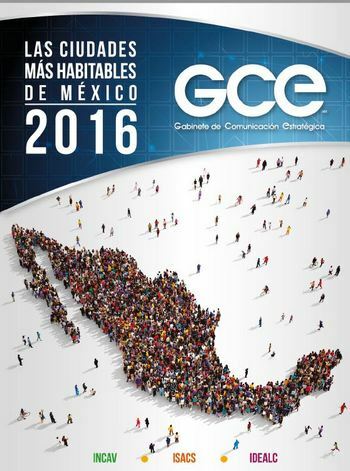 (Geo-Mexico Fig 23.1; all rights reserved). We drew attention a few years ago to the issue of Empty houses in Mexico, a problem due in part to on-going rural-urban migration, and in part to the construction of millions of new homes across Mexico. Thirty years ago, there were only 15 recognized metropolitan areas in Mexico, today there are 59. Poor coordination between the various government departments responsible for housing, services and land development has led to some settlements being authorized even in areas where ownership was disputed or that lacked adequate access to highways or basic services. Three years ago, a Mexico City news report entitled Desorden urbano dejó en el país millones de viviendas fantasmas claimed that as many as 4 million houses, many of them newly built, were standing empty. Other houses have been abandoned for a variety of reasons, ranging from the death of former owners, or owners moving to other areas, or being unable to keep up with mortgage and loan payments. Infonavit Housing. Credit: Habitat D.F. News reports claim that as many as 14 houses in a single street are abandoned in some areas, such as the Mineral de la Reforma district of the rapidly-growing city of Pachuca in the state of Hidalgo, causing problems for neighbors. Now, the Mexican Workers’ Housing Fund, Infonavit, has set itself the target of reclaiming 30,000 abandoned houses this year. Infonavit has funded hundreds of developments with small, cookie-cutter houses, across Mexico. Members of Infonavit can access a series of housing-related mortgage products, to buy or remodel a new or existing home. Starting last year, Infonavit began to rescue abandoned houses, renovate them and then auction them off to its members. Initial success was limited, with only about half of the repossessed homes being sold on, but in the first few months of this year, Infonavit has successfully sold off 92% of the first 3,000 houses it has recovered. This year, Infonavit plans to auction off homes in Chihuahua, Nuevo León, Tamaulipas, Hidalgo and the State of México. On 21 June, the public transit system known as ACAbús will finally officially begin operations in the resort city of Acapulco in Guerrero. 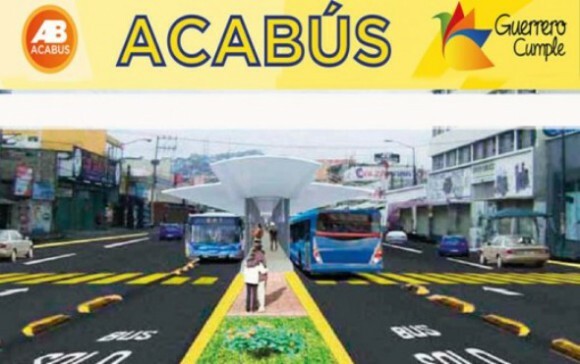 ACAbús began trial operations on 31 May, following several years of delays. The service employs 135 Dina buses of various kinds, all equipped with state-of-the-art technology to reduce emissions, save fuel and will substitute 366 old, less efficient vehicles to the benefit of both locals and tourists. The system represents an investment of around $140 million, roughly two-thirds for highway and transit stop refurbishment and one-third for operating equipment (vehicles and travel card machines). ACAbús connects the resort’s many tourism attractions and facilities. 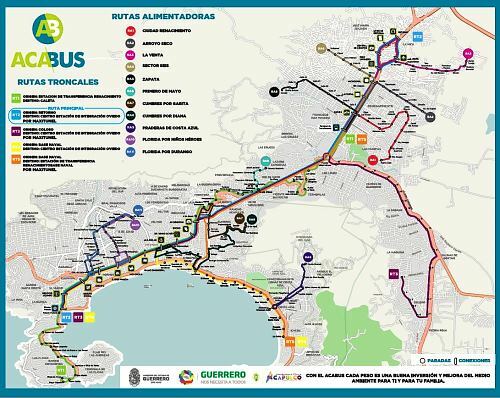 The main central axis (map) is a 16-km (10 mile) long route from Las Cruces along Avenida Cuauhtémoc to Caleta, with 18 stops along the way. This portion will be confined solely to rapid transit articulated buses. Four trunk routes supplement this central axis, each with a limited number of stops. The ones of interest to most tourists will be Routes 4 and 5, which run along the main Costera Miguel Alemán highway. A series of shorter feeder routes provides easy access from most parts of the city to the nearest trunk route. Passengers are required to obtain a pre-paid card in order to use the system. Most journeys, including connecting service, will cost $10 pesos (less than 60 cents U.S.). The number of different bus routes in Acapulco has been reduced from about 220 to 120, but travel times should be greatly improved. Authorities claim that the system should cut regular traffic by about 25%, and that everyone will benefit as it means that older vehicles have been removed from the roads with a decrease in total emissions. This little 77-page gem only recently came to my attention, but is sufficiently interesting, for lots of different reasons, to make it well worth reading if you have the chance. Written in straightforward, non-academic language, Stanislawski sets about unpacking the factors explaining the land use patterns for eleven towns in the western Mexico state of Michoacán. 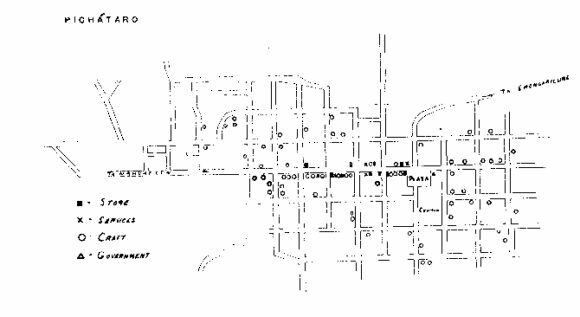 Stanislawski knows the land use patterns of these town, because he painstakingly compiled them, with the help of multiple informants in each town, in the 1940s. 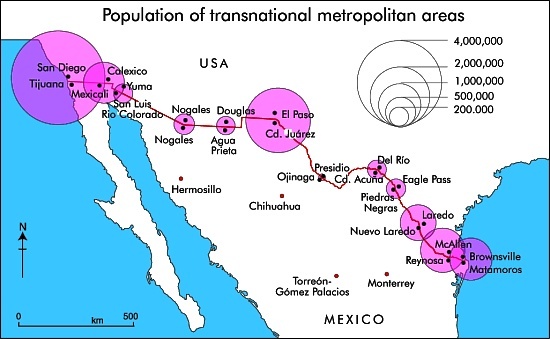 He assumed that each town would be influenced by its geographic area, and therefore chose eleven towns that he thought would be a systematic sample: one in the coastal lowlands, three in the low Balsas valley, two in the upper Balsas valley (close to the temperate slopes), four within the mountain ranges of the volcanic area of Michoacán, and one at an elevation of 2400 m (8000 ft). The maps he produced revealed that “the geographical region could not explain the differences between the towns except in part.” At least as important, Stanislawski decided, was which of the two basic cultural groups – Hispanic or Indian – was predominant in the town. He proposed a threefold classification: Hispanic, Indian or dual-character. 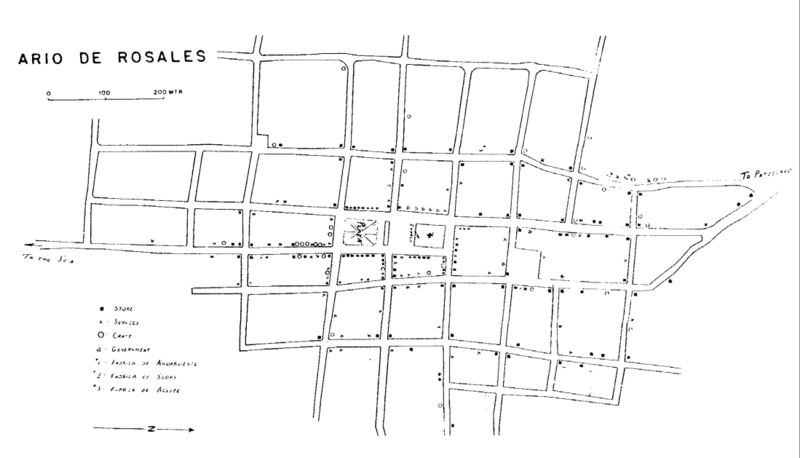 On this basis, Aria de Rosales (upper map), with its imposing plaza the focus of most commercial activity, is an Hispanic town. On the other hand, Pichátaro (lower map), where the plaza is unimportant, is Indian. Of course, these differences, identified by Stanislawski in the 1940s, do not necessarily apply today. Since the 1940s, transport systems have changed, there have been waves of migration out of many Michoacán towns, and the range of economic activities in towns has increased significantly, with a trend away from primary activities and a sharp rise in tertiary 9service) activities. In the 1980s (sadly ignorant at the time of Stanislawski’s work), I employed a small army of geography students to undertake a somewhat similar mapping exercise in various Michoacán settlements, ranging in size from the small village of Jungapeo to the mining town of Angangueo and the large city of Zitácuaro. For an example of this kind of work, see The distribution of retail activities in the city of Zitácuaro, Michoácan, Mexico. Sadly, those 1980s maps were later discarded during a clean-out of the department map cabinet by a well-intentioned, if ill-informed, successor. 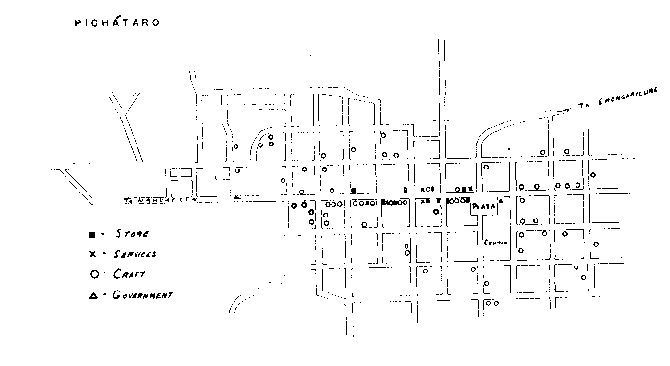 The Anatomy of Eleven Towns in Michoacán (review) by Dan Stanislawski (University of Texas, Institute of Latin American Studies, Latin American Studies X, 1950); reprinted by Greenwood Press, New York, 1969.